ABS-CBN News’ team of reporters will monitor major developments inside and outside the Batasang Pambansa Complex in Quezon City, with award-winning anchors Ted Failon and Lynda Jumilla at the helm of the special coverage on ABS-CBN, starting at 3:20pm. They will provide pre and post SONA analysis and will give way to breaking reports and the live feed of the President's SONA. Programs of ANC, on the other hand, will also focus on the SONA beginning with “Mornings@ANC” at 5:30 am that will feature past and current government officials as guests, followed by multi-awarded broadcast journalist Karen Davila’s “Headstart” at 8am, “Market Edge” anchored by Cathy Yang at 9am, and “News Now” with Nancy Irlanda at 10am. The pre-SONA special will start at 1pm to be anchored by Davila, followed by Yang at 2:30pm. The SONA coverage proper, meanwhile, will be led by Tony Velasquez and Karmina Constantino, with special guests Teddy Locsin, Jr. and Prof. Prospero de Vera, while TJ Manotoc will be discussing what people are saying about the SONA online. Tina Monson Palma will end the special SONA coverage for ANC through her program “Talkback with Tina Monson Palma” at 7pm. 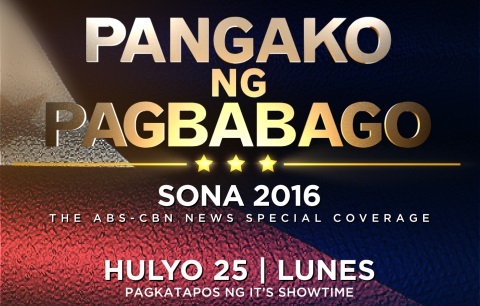 ABS-CBN News, the largest news organization in the country, is going all out in covering the first ever State of the Nation Address (SONA) of President Rodrigo Duterte on Monday (July 25), bringing Filipinos closer to the action with live, up-to-date reports via a cross-platform approach on ABS-CBN, ANC, the ABS-CBN News Channel on cable, DZMM 630, DZMM TeleRadyo, news.abs-cbn.com, and ABS-CBN News' social media accounts. The leading media and entertainment company’s flagship AM radio station, DZMM 630, will start its SONA coverage at 12nn with Julius Babao’s “Radyo Patrol Balita Alas Dose” program followed by Vic Lima’s and Ruby Tayag’s sitdown with Dr. Edna Co of the University of the Philippines and Dr. Dennis Coronacion of the University of Santo Tomas at 1pm. Karen Davila will be on board at 3pm with political analyst Prof. Julio Teehankee, who will also make an appearance in Anthony Tabrena’s and Gerry Baja’s “Dos Por Dos” at 5:30pm. Filipinos on the go and out of the country can also get the newest SONA updates from ABS-CBN News’ Twitter accounts @ABSCBNNews, @ANCALERTS, and @DZMMTeleRadyo​. President Duterte's SONA will also be carried real-time via live streaming on the ABS-CBN News website (news.abs-cbn.com) and via Facebook Live on ABS-CBN News' official Facebook page (www.facebook.com/abscbnNEWS) that will also offer live updates and special features on the SONA. ABS-CBN Integrated News head Ging Reyes said the organization has been planning for weeks to provide the most comprehensive coverage of another historic event in the Duterte presidency. "We have a new President, who's been in office for just over a month and diverse audiences who are very eager to listen to his views on where he intends to bring the country in the next six years. Our comprehensive coverage of President Duterte's SONA is meant to reach Filipinos all over the world, who are closely monitoring new policies and programs under the new administration and how these will benefit the common good," explained Reyes. Tune in to ABS-CBN’s “Pangako ng Pagbabago: SONA 2016” this Monday (July 25) for President Rodrigo Duterte’s first State of the Nation Address on ABS-CBN on free TV, ANC on cable, DZMM TeleRadyo on cable and ABS-CBN TVplus, DZMM Radyo 630, news.abs-cbn.com, and www.facebook.com/abscbnNEWS. Tweet your thoughts on the SONA by using the hashtag #Du30SONA2016.